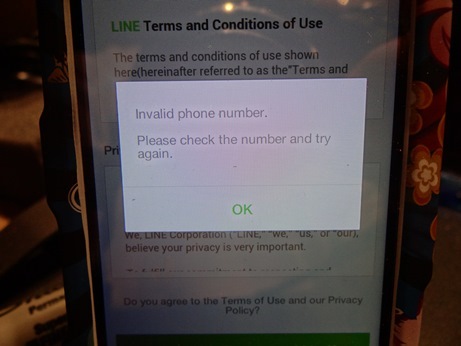 I have tried to register my FreedomPop phone number with Line app installed in the Samsung Galaxy Victory, but the LINE app responded with "Invalid Phone Number". I am using the phone number registered with FreedomPop. Does LINE app use short codes for texting ? If so, FP is working on supporting short codes into a future upgrade. If not, wait until admin comes into office in morning. It says this when installing this app.. The app may not install properly if your network connection is unstable or if your device does not have enough storage space. Please check the strength of your connection and the amount of free storage space you have and try again. Did you have a chance to check both before you try and install? Like what Rich said, Line requires MMS verification which we don't have support for yet, hopefully FreedomPop will make the upgrade! I have tried both numbers to register LINE - 1) number native to the phone, 2) phone number selected when I purchase FreedomPop. Both number came back same "Invalid Phone Number" from Line. Do you have an estimate time when an upgrade will make the LINE app work? The native number you refer to will not work for any apps. So ignore that one. It's used by FP to communicate with their Sprint access for your account. The number you picked is the correct number. Those are the digits to use. Read up on your LINE app on how the number is to be input. Use 1 before the 10 digits, or use dashes, or use () & -, just digits, etc. It must be very fussy. I just talked to somebody that has line app, They claim that the app is not compatible with VOIP apps....But I can't find anything online to support his claim??? @njfulwider5‌ I tried getting Line to work on my bro's S2 and it was a no go. Looks like it won't work since FreedomPop and most other VoIP providers use bandwidth.net which appears to not be allowed on Line due to spamming reasons. I used the phone number that I picked and have tried to use many different combination of inputs for the phone number (use dashes, or use () & -...etc), I still get the same "Invalid Phone Number" message. In case you missed it, see note above from chmexdf5633‌. I've followed @chmexdf5633 suggestion and sign-in LINE using Facebook account, it allowed me to create an LINE account on the phone. So the LINE app installed on my Samsung Galaxy Victory phone and works fine (I can send/receive message and make calls & video chat). However, the problem still persists when I try to register the Freedompop phone number with LINE (phone number selected when I purchase FreedomPop). I again tried with many combination of inputs for the phone number (use dashes, or use () & -...etc), I still get the same "Invalid Phone Number" message. Given the popularity of LINE app, I searched the forum and there are almost no complaint from others about this. So I think this is unique to my case. If anyone has a solution and can help, please let me know. @Jeff Wey , I also had the same problem with linking line app to my phone #, and thats the only workaround to making it work... is there any advantage to linking it to your phone number? Well, with my previous phones (Sprint and T-Mobile), I had no problem register LINE with their phone numbers. Registering the phone number with LINE allows my contacts to get updated with my new phone numbers. If certain Apps are not going to work as expected, Freedompop should disclose this before buyers purchase their product.